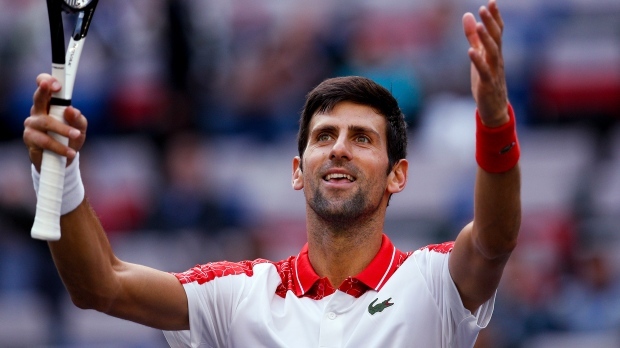 SHANGHAI -- Novak Djokovic earned partial revenge when he beat Marco Cecchinato 6-4, 6-0 to reach the Shanghai Masters quarterfinals on Thursday. "I was making him play always an extra shot," Djokovic said. "I was aggressive when I needed to be. The second set was perfect, really. "I wanted to start off well because I know that he battles hard and he makes you deserve every point, win every point." Djokovic saved both break points he faced on serve in the match and successfully broke Cecchinato's serve on four of 11 offerings. Djokovic will take on seventh-seeded Kevin Anderson of South Africa, whom he leads 6-1 on head-to-heads. Djokovic defeated Anderson in straight sets in the Wimbledon final in July. Zverev will play 11th-seeded Kyle Edmund after the Briton defeated Nicolas Jarry of Chile 7-6 (5), 6-3.